Here at iDisciple, we’re constantly reminded of all the great blessings God has given us this year. We give thanks to the Lord for the opportunity to help impact His Kingdom. 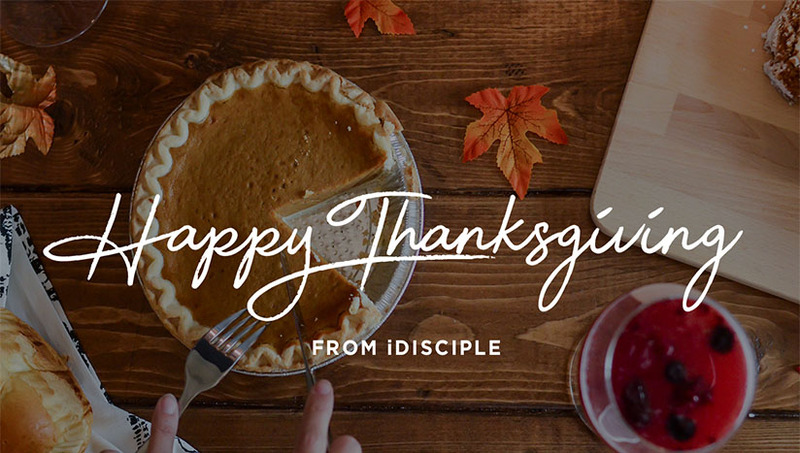 Check out what the else the team at iDisciple is giving thanks for this year. Alejandro – I am thankful because this year we launched iDisciple Español and after 12 years living in the states I had the opportunity to go back to Colombia for a mission trip. I am thankful God provides for my family and also because Colombia is going to the World Cup. John – I think one of the things I’m most thankful for is the opportunities we have in this country; around the world there’s so much poverty and lost opportunities and as Americans we don’t see that daily. We don’t have to deal with that first hand for the most part and even when we do, we have a community to support us. I’m thankful that we were blessed to be born in a country that gives us opportunities. I’m also thankful for friends; with your family you spend specific occasions together but your friends are who you do life with and spend time together every day. I’m thankful for Bobby G’s pizza, it’s the best stuff ever. Dan – I’m thankful that I got to take a vacation this year, I’m thankful for my willingness to learn. I’m thankful for my leaders. I’m thankful for Bobby G’s Pizza. I am thankful for Sports, Music, the Internet, for my Job, for my Uncle and for my mom. Alex – I’m thankful for iDisciple! Bri – I am thankful for a year full of good health and just great memories; I got to travel with my family and explore and made great memories with them. I’m thankful for YoungLife, the ministry I work with and I’m thankful for my work family and that I get to be with people who lift me up. Lianne – I am thankful for my kids and the gift that is motherhood. I’m thankful for casual work days, our home and just a safe environment for my family. And queso, always queso. Emma – I am thankful for the opportunity to travel. I had the opportunity to go to both Peru and East Africa this past year. I’m thankful for independence, the ability to live alone and being able to grow this past year. And lastly, I’m thankful for Uber eats. I can order food to my doorstep at any time, especially Thai food. Ryn – I am thankful for diet dr. pepper. I’m thankful for my family, my community and the people around. I’m thankful for pumpkin spice everything. Shubha – I’m thankful for clean air and clean water, good food and my family of course. I’m thankful for Indian Music. George – I’m thankful for being alive. November of 2015 I was diagnosed with cancer and no one ever looks forward to being diagnosed with cancer but it really puts things into perspective for me and I am thankful to be alive. Israel – I’m thankful for family, for my daughter. All the great opportunities that I have in this great country & I’m also thankful for God; for all the blessings he’s given me and my family. Jake – I’m thankful for coffee, I’m thankful for Waffle House, for my wife and my daughters and the fact that we have a good, healthy family. It’s been a great year. I’m thankful for a great place to work with great friends. With family close by, and getting to spend the holidays with them. Kamilah – Well, I’m super thankful for the fact that I was able to buy a house this year, adulting is fun! I’m thankful for genuine friendships & good food. I really like good food. Jacob– I’m thankful for the office season 1, the office season 2, and the office seasons 5 & 7. I’m thankful for Stranger Things & Stranger Things season 2. I’m thankful for Bobby G’s, it’s the best pizza near our place of work. I’m thankful for my wife & celebrating our anniversary in England. Go to Bobby G’s, get 2 slices & load them up with ingredients. Andres – I’m thankful for the constant love and support I receive from my parents, for having a tight knit group of friends, and my cat. Being able to spend a lot of time with my cat, she’s getting older now and so all time with her is precious.